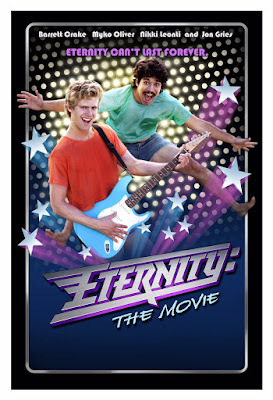 ETERNITY: THE MOVIE deals with a Hall & Oates inspired duo (Barrett Crake, Myko Olivier) and their rise to fame in the 80's as an R&B group, complete with marginally amusing musical numbers, mustaches, and permed hair. This one note, 80's musical cheesefest is available for streaming on Amazon, VUDU, and YouTube, but as always, you're better off leaving this method of modern crap to us and watching old Hall & Oates videos instead. You can check out the Rapunzel position video mentioned in the show HERE.